"A film essay on the peasant society of Kypseli, a small isolated Greek village on the island of Thira. Depicts how the people of Kypseli divide time, space, material possessions, and activities according to an underlying pattern based on the separation of the sexes, and shows how this division determines the village social structure." 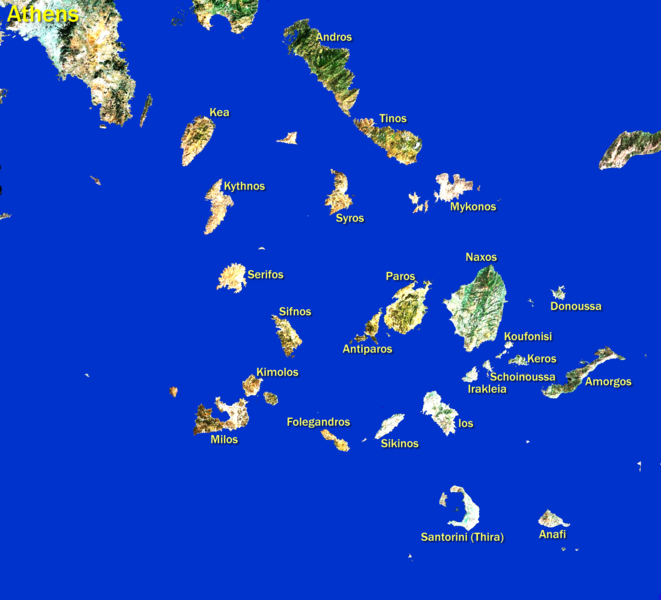 Kypseli, located on the Greek island of Thera (or Santorini) which is 125 miles south of Athens and 72 miles north of Crete, is a peasant village of 350 persons who major crops are barley and grapes (for wine), and tomatoes. It is one of the most isolated, traditional villages on this island -- a condition greatly encouraged by the prevailing practice of village endogamous marriage (both spouses coming from within the village). A major point of the film is to depict how the people of Kypseli divide time, space, material possessions, and activities according to an underlying pattern based on the separation of sexes, and how this division, in turn, determines the village social structure. In the morning, for example, women control the house and men relax in the village square or work the fields. Later the women leave the courtyard to the men and retire to their kitchens, which men rarely enter except to eat their evening meal, alone and before the women and children eat. This spatial and temporal separation is also seen in colorful glimpses inside taverns (where women congregate only in the kitchens), in church, and in the public square. A second major point is that these separate realities of the two sexes are of unequal status and value. Life in Kypseli is organized on the principle of male dominance. A man's life is in the marketplace and fields. He returns home to his wife's kitchen -- a different world, isolated, and protected from the more cosmopolitan parts of Thera. The film examines the unconscious assumptions of the people of Kypseli and reveals how their social structure is related to the prevalent view of men as generous, strong, brave, and pure, whereas women are considered shameful, weak, deceitful, tainted, and incorrigible. For example, women may never enter the wine caves, because they would pollute and spoil the wine. In contrast, men may watch baking at the public ovens, though only from a distance; but if they came closer they would not contaminate the bread. Men also have more economic and political power, for they own their paternally inherited land, animals, and equipment personally and permanently. The materially inherited houses of the women, however, become "family" property and are used as dowry for daughters. The film concludes by examining the implications of the fact that women are never fully members of any family but always partial members of two -- their father's and their husband's. 1977 Review of the film. Women in Film: Kypseli: Women and Men Apartâ€”A DividedÂ Reality. Filmed by Susannah Hoffman, Richard Cowan, and Paul Aratow. AmericanÂ Anthropologist, 79: 194â€“195. 1983 Greek Women: Sacred or Profane. Journal of Modern Greek Studies 1(1), 185-202. 1976 "The Ethnography of the Islands: Thera." In: Regional Variation in Modern Greece and Cyprus: Toward a Perspective on the ethnography of Greece, Muriel Dimen and Ernestine Friedl, eds. Annals of the New York Academy of Science 268:328-340. 2004 The Olive and the Caper: Adventures in Greek Cooking. NY: Workman, 2004. "Discusses social and economic change in the Cypriot village of "Kalo" as an example of the impact of modern society and technology on rural villages all over the world." "An examination of women in purdah or hijab (seclusion) in Morocco. Explores their lives and interests and what part religion plays in their lives. Shows a wedding and the effects of seclusion on women of Islam." Zikakou, Ioanna. "The Formation of Santorini." Greek Reporter, 05 December 2014. Accessed 21 January 2018. http://greece.greekreporter.com/2014/12/05/the-formation-of-santorini-video/.